rec. Matthäuskirche, Pforzheim, Germany, 23-24 March 2006; 18-20 May 2006; 26-27 February 2007. DDD. Booklet with notes in English and German. At first sight, this looks like a collection of the usual baroque trumpet suspects but closer inspection reveals several surprises. Domenico Gabrielli was a completely new name to me, though I should, perhaps, have known this sonata at least, since the music is available online (see below for details). It is, in fact, an attractive enough piece. 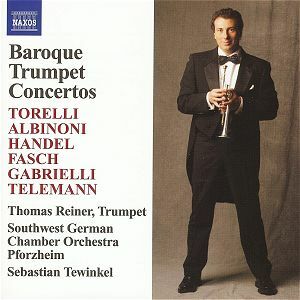 Not all the music on this CD started life for the trumpet: the Albinoni, Handel Concerto No.3 and the Telemann Concerto all began as oboe concertos, here played on the piccolo trumpet in what the notes describe as “apt transcriptions”. This may be due in part to a desire not to duplicate items available on several other Naxos CDs of the baroque trumpet repertoire – The Art of the Baroque Trumpet, Volumes 1-5; Famous Trumpet Concertos, Imperial Fanfares and a disc of Trumpet Concertos by Haydn, Hummel, Neruda and Weber – but, in fact, there is overlap with, for example, The Art of the Baroque Trumpet Volume 1 which contains both the Fasch concerto and Handel’s celebrated Water Piece. The Albinoni is one of the best-known concertos from his Op.9 collection. How apt the listener finds the transcription will depend on the extent to which one tolerates the more insistent trumpet by comparison with the much gentler oboe original. Those who do not know the original will probably find the result very acceptable; those acquainted with the original will be harder to convince. In good performances of Albinoni’s original Op.9 concerti, the oboe is a partner with the orchestra – Albinoni described these as concertos with rather than for oboe – in the trumpet transcription here the soloist definitely dominates. By comparison with the version of the original by Pierre Pierlot and I Solisti Veneti under Claudio Scimone the slow movement (Adagio) sounds rather too hurried (4:02 against 6:00) and the ornaments less elegantly executed on the trumpet than on the oboe. This Warner Apex CD (0927 49020 2) of seven of the Op.9 concerti is the most recommendable version in the same price range as this Naxos CD. The complete 2-CD set of Op.9 on Ultima 3984 25593 2 also seems still to be available, despite the Penguin Guide’s statement to the contrary. Naxos themselves also have three recommendable CDs combining concertos from Op.7 and Op.9 (Op.9/2 is on 8.550739: the Adagio on this version, at 5:23, is closer to the Pierlot/Scimone tempo than to the version on the new Naxos CD). There is an absurdly inexpensive Brilliant Classics set of the Op.7 and Op.9 concertos (92791). There are also recommendable bargain-price discs containing Op.9/2 from Regis (RRC1095) and Virgin Veritas (5 61878 2, a 2-CD set of Albinoni and Telemann). At full price, the complete AAM/Hogwood version (458 129 2) is the best recommendation; the Chandos Chaconne set with Collegium Musicum 90 is also very recommendable but less conveniently presented on 3 CDs, each containing concertos from Op.7 and Op.9. (Op.9/2 is on CHAN0579). Other than in the Adagio of the Albinoni, tempi on the new CD are mostly apt – in the Handel Water Piece, for example, each movement is within a few seconds of Naxos’s own rival version on The Art of the Baroque Trumpet Vol.1. If the Albinoni is the best music on the disc, this arrangement of music largely ‘borrowed’ from Handel’s own works, is the best piece on the CD originally composed for trumpet. The Overture is, perhaps, a little lacking in grandeur but the other items, especially the graceful Air (minuet) central movement, not one of the ‘borrowings’, go well. Handel’s Oboe Concertos are not among his most commonly recorded pieces, though there are fine bargain-price versions of them on Regis (RRC1106) – a splendid disc, according to Christopher Fifield’s review) and Naxos (8.553430). The trumpet transcription on the new CD is well played though, as in the Albinoni, the trumpet sounds more prominent than the oboe and the Sarabande: Largo movement sounds rather too fast by comparison with Naxos’s own version of the original (2:06 against 3:02). Both here and in the transcribed Telemann Oboe Concerto the trumpet versions sound well enough in their own right but most will prefer them on the instrument for which they were written. I have already referred to the availability of the icking online score of the Gabrielli. A score of the Torelli Sinfonia may also be found at icking-music. (NB: this is an arrangement for a modern orchestra but if you ignore the double-bass part, which doubles the cello or the harpsichord left-hand, you get more or less what Torelli wrote.) The Albinoni, in an arrangement for trumpet and organ, is also available at icking. (The solo part in this score is given to the organ at bars 26-33.) In all three cases the movements have to be downloaded separately but none of the movements constitutes a large file. Scores of some of the other works on this CD may be found by looking on the composer-index at icking. All the music on this CD is well worth hearing, though with my stated reservations in the case of the transcriptions. Some will find these reservations paramount, but if the repertoire appeals, these are generally reliable performances – the odd over-fast slow movement in the transcribed works excepted – with good solo playing, orchestral support and recording. I had not encountered Thomas Reiner, the soloist, before, other than as a member of Atlantis Brass. The notes in the booklet, which refer to his “lightness in the upper register … reminiscent of the natural trumpet, while retaining the brilliance of the modern instrument” have it about right: he does, indeed, strike a good balance between the two, though I could have wished for more elegant ornamentation in places. Reiner has featured as a member of the Arta Trumpet Ensemble in a baroque concert on Arta ACD6060, a now-deleted CD which Roy Brewer here on Musicweb felt “missed the baroque spirit by several miles”, though admiring the proficiency of the playing. On the evidence of the present recording, matters have evidently improved. The SW German CO, too, recording veterans, strike a reasonable balance: a moderate-sized ensemble of modern instruments employing many of the techniques of period performers. They have been directed by Sebastian Tewinkel since 2002, though he, too, was new to me and I have been unable to find any reviews of his performances. Competition in this repertoire is fierce, even in this lowest price-range. Håkan Hardenberger on a mid-price Philips Duo (464 028 2) offers excellent performances; though entitled ‘Famous Classical Trumpet Concertos’, this 2-CD set also contains some baroque works. At around the same bargain price as the Naxos, Crispian Steele-Perkins on RRC1053 – a superb Regis reissue of an IMP original which I have long treasured – and in more out-of-the-way works on Hyperion Helios CDH55192 is also strongly recommendable. Of the various volumes of Naxos’s own Art of the Baroque Trumpet, all starring Niklas Eklund on baroque trumpet, with various orchestras, Volume 4, with the period-instrument Drottningholm Ensemble (8.554375) has had good reviews in some quarters and Volume 5 (8.555099) was very well received by Roy Brewer here on Musicweb. None of these CDs involve duplication of material on the new disc.